A very moist, delicious and healthy Vegan Flaxseed Carrot and Banana Cake with spices, sandwiched and topped with Coconut cream frosting and Bergamot fruit preserve. A few weeks ago it was my daughter’s name day, which in Greece we celebrate the same way we celebrate birthdays. So, as it falls during Lent, I made this Lenten version, which does not contain any eggs or animal products. I chose to make a vegan carrot cake, using flaxseed as an egg substitue. I’ve used this in the past and I know that the flaxseed should be ground and soaked in water. To replace one egg, whisk together 1 tablespoon (7 grams) of ground flaxseeds with 3 tablespoons (45 grams) of water until fully absorbed and thickened. As we are in Athens, unfortunately my spice griinder, which is an attachment to my Kenwood mixer, is in Asisni. My idea was to soak the flaxseed in order to soften it and then grind them in a small food processor I have in Athens. Unfortunately, that didn’t work as they are too hard to mash and stayed almost intact. I was lucky enough to have ripe bananas at home, which I used as the binder for the cake as well as the egg substitute. The cake turned out delicious and you really couldn’t tell that it was vegan. Flaxseed are packed with many nutrients. They are high in Omega-3 fats, they are a rich source of lignans, vitamin B1 and and copper. They are also a good source of the minerals, dietary fibre etc. which make the cake very nutricious and healthy. The resulting flavor is just like carrot cake with a hint of banana and it tastes amazing with the vegan coconut whipped cream icing. Here are some more vegan cakes for you to try. A very moist, delicious and healthy Vegan Carrot Cake with Banana, Spices and topped with Coconut frosting and Bergamot fruit preserve. Preheat the oven to 180°C and grease and flour a 26 cm spring form pan, lined with parchment paper. Peel the carrots, cut them into smaller pieces and grind them in a food processor. If the carrot is not very fine, add some fluid (I added some of the milk). In the same food processor, add the banana and flaxseed and mash. Sieve the flour, corn flour baking powder, baking soda, cinnamon, cloves and nutmeg. Mix in vanilla sugar and salt. In the mixer bowl, beat together the olive oil, corn oil and sugar. Add the pureed carrot, banana and flaxseed mixture. Finally add the flour mixture and mix until combined. Empty the mixture in the prepared pan. Bake for 50 - 55 minutes or until a knife inserted in the middle, comes out clean. Invert the cake and remove the parchment paper. Cut the cake in the middle and wet each piece with bergamot syrup. Add half of the coconut whipped cream in the middle and add some pieces of bergamot preserve. Cover with the remaining coconut cream. 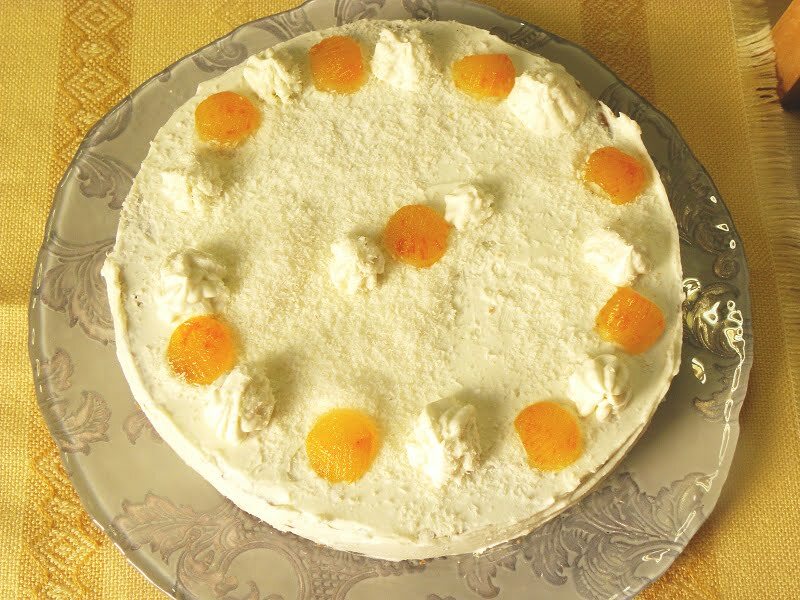 Decorate the cake with coconut and bergamot preserve..
Store the cake in the refrigerator up to one week.